17,880 people made Aliyah (immigrated) to Israel in the Jewish year 5770. 17,880 people made aliyah (immigrated) to Israel in the Jewish year 5770, according to Jewish Agency records - up from the previous year, when 15,180 people came to Israel via the Jewish Agency. 7,340 of the new arrivals came from former Soviet Union states, an increase of 16% in Aliyah from that region. Another 1,320 came from Ethiopia, at a rate determined by the government. 5,130 came to Israel from English-speaking countries. Of those, 3,350 were from the United States, 380 from Canada, 740 from Britain, 220 from Australia and New Zealand, and 260 from South Africa. Aliyah was up in western Europe as well. 2,420 residents of France, Belgium, Italy, and Switzerland decided to make Israel their new home in 5770, compared to 2,090 the year before. The majority of the Western European immigrants – 2,020 – came from France. 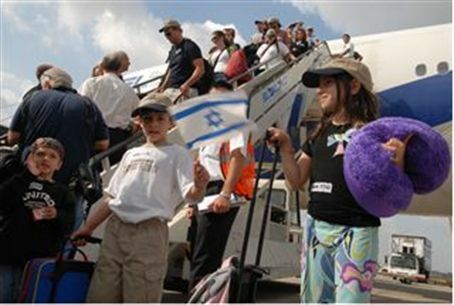 1,360 new immigrants arrived in Israel from Central and South America. 330 came from Argentina, 240 from Brazil, 160 from Mexico, 140 from Peru, 120 from Venezuela, and 90 from Uruguay. The sharpest jump in South American immigration to Israel was in Venezuela, where 120 left for Israel this year, compared to 40 the year before. Smaller groups of immigrants came from a variety of other countries, including Thailand, Japan, Tunisia, Nigeria, Kenya, Malawi, and Uganda. The increase in Aliyah over the past year “is particularly moving in light of the campaign to delegitimize Israel that has been running worldwide recently,” he added. “Each new immigrant is a bridge connecting his Diaspora community to his ancient-new homeland, Israel."